What a shock RINO Alaskan US Senator echos the Democrat party that the Senate does not have the votes to repeal Obamacare. As reported in The Hill, Murkowski ”mimicked a Democratic argument against GOP repeal efforts”; Democrats say that Republicans have gone back on their calls to focus on jobs by holding a health care vote as their first major action of the 112th Congress. Murkowski claims she would vote for the repeal of Obamacare, yet she calls it a waste of time? A note to Senator Murkowski, unlike your election in the 49th state, the rest of America elected Republicans who promised to do the will of the people and dismantle Obamacare. THIS IS WHY WE CALL THEM RINO FOLKS!!! To the voters of Alaska, you best make sure who you are voting for before you cast your ballot today. Republican primary loser and now write in candidate for the Alaska Senate has yet to confirm that she will caucus with the Republican party should she win. A Senator has to caucus with one party or the other, interesting how this entitlement, establishment RINO candidate refused to commit. Sen. Lisa Murkowski (R-Alaska) says she hasn’t yet committed to caucusing with Republicans if she wins her write-in bid against GOP nominee Joe Miller. “I am still a Republican I have not changed that. But I think it’s important to recognize I am not my party’s nominee,”Murkowski said Sunday in an interview with Fox News’s Greta Van Susteren. Murkowski, who lost her primary battle to Miller, has been waging an independent write-in campaign for reelection. If she wins, she acknowledged, it won’t just be Republicans who elected her. “It will be Alaskans that have asked me to go. That’s who I will be responding to from Day One,” Murkowski added. As Weasel Zippers states, this is exactly why Murkowski lost the GOP primary. She cannot be counted on. Why we love Sarah Palin … she calls it like we all know it to be … Palin called out on Fox News Sunday this morning with Chris Wallace the partisan, unethical CBS affiliate media and calls them “CORRUPT BASTARDS”. As reported earlier today, Alaska CBS affiliate KTVA were caught on a voice recording conspiring to create negative news stories and pick out potential “child molesters” in the crowd supporting Republican Tea Party candidate Joe Miller. I am saying that we have on tape the CBS reporters in the affiliate up there in Alaska saying, “Let’s find a child molester in the crowd as a supporter of Joe Miller. Let’s blast that. Let’s concoct a Rand Paul moment there. Let’s find any kind of chaos so we can tweet, “Ooh, there’s chaos. Joe Miller got punched.”” That’s sick. Those are corrupt bastards, Chris. From Breitbart TV, a some what better recording to listen to. UPDATE I: KTVA confirmed the authenticity of the tape Sunday but rejected as “absurd” the suggestion that reporters were trying to “fabricate” a negative story about Miller. KTVA General Manager Jerry Bever issued a statement that is rather hard to believe when one listens to the audio and understands the context of the discussion and when it took place. KTVA General Manager Jerry Bever issued a lengthy statement Sunday calling the recording “unfortunate because it does not accurately reflect the journalistic standards of our newsroom.” But he said Miller’s analysis and transcript of the recording are “inaccurate,” noting that the recording only captured newsroom personnel talking at the end of a “coverage planning meeting” regarding the Anchorage rally last Thursday. “The group of KTVA news personnel was reviewing potential ‘what-if’ scenarios,discussing the likelihood of events at the rally and how KTVA might logistically disseminate any breaking news,” Bever said. “The perception that this garbled, out of context recording may leave is unfortunate, but to allege that our staff was discussing or planning to create or fabricate stories regarding candidate Miller is absurd. The complete conversation was about what others might be able to do to cause disruption within the Miller campaign, not what KTVA could do,” he said. Really? Take a good listen to the audio of this tape and read the transcript. Although many parts of the tape are inaudible, there is laughter from the KTVA news people when discussing the so called “what-if” scenarios. Laughter? Likelihood of scenarios at the event, Seriously? Comments about Rand Paul like moments and finding the child molesters in the crowd are potential scenarios to cover? The MSM was caught red handed in a conversation that was never intended to be heard and they have no explanation as to how to explain it. Remember, the conversation would have occurred right after they got off the phone with the Miller campaign. MSM liberal bias at it again … this time trying to affect an election … UNBELIEVABLE! For any one not to believe that their is a liberal slant to the MSM would have to have just fallen off a turnip truck. Up in Alaska, the 49th state, the media has long played favorites in their coverage of the Alaska US Senate campaign between entitled, write-in, Republican establishment candidate Lisa Murkowski, Republican Joe Miller and Democrat Scott McAdams. However, as stated at Conservatives 4 Palin, there is bias in the media and then there is at outrageous and unethical behavior of try to affect the outcome of an election. Enter CBS Anchorage affiliate KTVA caught with their hand in the media bias, election altering, making up stories cookie jar. As reported at BIG GOVERNMENT, the KTVA reporters were caught on audio trying to conspire and smear Joe Miller’s campaign by making up stories to purposely harm his campaign. SICK! Listen to the audioof the MSM trying to adversely affect an outcome with false reporting and making up controversies. As Republicans wonder whether the Lisa Murkowski, the spoiled and selfish sore loser of the GOP primary will have an impact on the 2010 US Senate race in Alaska as she runs as an independent … new polls are out that show the elite, establishment Murkowski behind the GOP nominee and Tea Party backed Bill Miller by double digits. Republican leaders are angry with Sen. Lisa Murkowski (R-Alaska) for jeopardizing their chances of winning the Senate. Murkowski’s decision to mount a write-in campaign risks splitting the Republican vote between two candidates and could cost her party a safe GOP seat. “I am bothered by anything that makes it less likely that we can elect a Republican, especially in a state where we had every hope of electing one,” Senate GOP Whip Jon Kyl (R-Ariz.) said Monday. “Both in Delaware and in Alaska now, it’s less likely than it was just two weeks ago. And looking at how we might try to regain control of the Senate, that’s the part that bothers me,” Kyl said. Lisa Murkowski went back on her word that she would support the Republican winner of the Alaska US Senate primary for one reason and one reason alone, she lost. The voters spoke and Murkowski could not give up the drug of political power. Murkowski thinks that Miller is radical and extreme? Then why did Miller win the primary with a record amount of the vote in a GOP primary? It is sad that establishment politicians cannot just let go and go home after they lose an election. Murkowski is the poster child of what is wrong with politicians who think that America cannot go on with out them. “I won the Republican primary with the largest Republican voter turnout in the history of this state, and we’ve had an extraordinary number come behind this campaign in the days following that, and even more coming behind this campaign after [Murkowski] announced her write-in campaign, which of course contradicted the word she gave just a few days before the primary that she would support the victor of the Republican primary,” Miller told CNN Chief National Correspondent John King. However, it would appear that the Alaska voters are not buying that Murkowski is an independent, nor are they believing that she should run against the candidate Joe Miller who won the primary. In the most recent Rasmussen poll, Miller have a double digit lead over Murkowski and the Democrat candidate McAdams. Miller leads 42%, Murkowski 27% and McAdams 25%. Republican Joe Miller attracts 42% of the vote in the first Rasmussen Reports poll of the Alaska Senate racesince GOP Senator Lisa Murkowski announced her write-in campaign to try to keep her job. The telephone survey of Likely Voters in Alaska shows Murkowski picking up 27% of the vote and Democrat Scott McAdams earning 25%. One percent (1%) say they’d prefer some other candidate, and five percent (5%) are undecided. 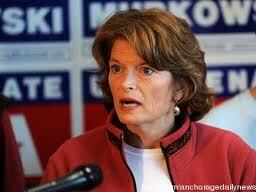 The US Senate race in Alaska has been made much more difficult by Murkowski’s selfish act. For a candidate who was solely supported by the GOP in the primary and in past elections lost, it is quite telling what Murkowski really thinks of the Republican party now that she lost a primary. Is she looking out for the GOP, Alaska or herself? The answer is obviously the latter.